Main Sequence will be releasing a new update on our PCRecruiter hosted servers this week. As always, we’ll be making a variety of fixes and improvements to the speed and functionality of the system, but we wanted to draw your attention to a new workflow enhancing user preference. Click ‘System’ in the main menu. Click on the username you want to adjust. Select ‘Preferences’ from the side menu. This area contains checkboxes that will Hold Sub-Navigation for the Name, Company, and Position Lists. Sub-Navigation refers to the left-hand navigation menu items on Name, Company, and Position records. For example, if you’re looking at Name records the Sub-Navigation menu can take you from the main field display/edit screen to the specific panels for Resume, Notes, Activities, Attachments, Interviews, etc. When you click on a record from a Search Result or Rollup List in the upper frame of PCRecruiter, the system loads the lower frame with the main view of that record’s fields. However, with this new preference enabled, PCRecruiter will remember which area of the record you last viewed, and will automatically load that same area of the next record that’s loaded. This can save clicks and time in a number of situations. For example, you can review the resumes of one record after another by clicking on them from a list, as shown in this accompanying animation. Similarly, you can view the ‘Names’ list on company after company, or the ‘Pipeline’ on several jobs in a row without having to re-select the desired area from the nav menu. Whenever you return to the Name, Company, or Position record view, you’ll always begin on whichever panel you were last viewing. The system will clear its memory of your last viewed area when you close or reload the browser window or when you log out of PCRecruiter. Another improvement in this update is the addition of new API calls for adding and removing records from Rollup Lists. This will allow basic Rollup manipulation via our public API, expanding the capabilities for integrated apps and utilities from Main Sequence and others. An API, which stand for ‘application programming interface,’ is simply a list of commands that one program can send to another, along with definitions about the format of those commands. 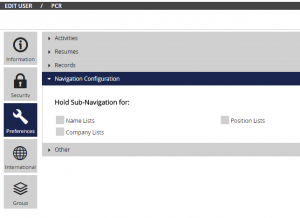 The PCRecruiter API allows software to securely connect to a PCR database to interact with the records. Not only does the API give Main Sequence’s own PCRecruiter Portal for Microsoft Outlook, PCRecruiter Mobile App, and PCR Capture extension the ability to add, remove, and manage records in the system, but the API also gives third-party vendors the capabilities they need to write applications and services that connect with PCRecruiter as well. The complete PCRecruiter API documentation is available for software developers to review. with the API up, will we now be able to text right from a rollup list? Hi Matt. These new API calls would allows third-party developers to add and remove records from rollups as well as to change the status of records on the list (although automation plans are not triggered in this case). If you’re interested in sending text messages, you’d need to have RingCentral or some other partner SMS service connected to your PCR setup. Those services would allow you to send a text to people on a rollup list if they have opted into receiving your messages. The Navigation configuration option is NOT an option in my user interface as described in this notice, even though I got this notice. What’s up with that? Please reach out to me to set this up so it’s there and set to hold navigation. Hi Ronnie. As noted in the posting, this new option is coming later this week – likely tomorrow if all of the final testing goes well! We’re just letting everyone know about the upcoming change in advance. Great update and all very helpful to workflow minded producers. Looking forward to using it! Re Hold Sub-Navigation option, the desired functionality is highly contextual. IMO, there should be a “Hold” check on the Name screen that triggers this functionality rather than a global preference. Thanks for the feedback, Peter! We’ll mention that to the development team for consideration. When will the sub-nav feature be completely rolled out? Hi Paul – An issue in the update last week required it to be held back at the last minute, but the team is hard at work on the fix for it and should be pushing this change out within the next couple of days. Thanks for your patience! The update has gone live this morning. Thanks for your patience! I will give up using Version 8 and start learning Version 9 when the propeller heads over there make the photos that my staff have spent THOUSANDS of hours loading into the database big enough where we don’t need a magnifying glass to see them when a record is displayed. That’s all that’s holding you back? Well, there may be an easy solution for that, Ron! I’ll get in touch with you directly. Hi Daniel! It ought to be out this week. It’s exceedingly rare for us to release and then rescind an update. This one exhibited problems on the initial rollout that required some extensive code changes to correct, so it’s taken a bit longer than we’d like to get the new changes online. They’re just about ready to go though and should be through the testing phase and onto the live servers before Friday. Thanks for your patience! This update is now active!